Herb gardens are a favorite of many who like to cook foods infused with delicate or strong flavors of herbal bouquets. The kinds of herbs you grow are often based on what you cook and your growing space. My herb garden is in containers on a deck in pots. Cutting, drying and freezing all summer I have enough for the winter soups, stews, and heavier meals of the winter months and fresh herbs for the lighter fare of the summer. Found on my deck in containers are Thai Basil, Spicy Basil, Lemon Basil, Sweet Basil, Oregano (Greek and Italian), Dill, Tarragon, Sage, Thyme (French and Regular), Parsley (Curly and Flat), Cilantro, Marjoram, Rosemary and 3 types of mint. 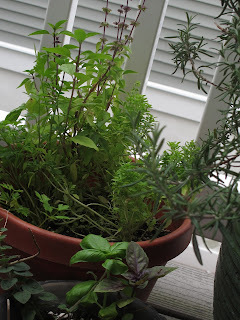 These are the herbs I use the most and have the room to grow in abundance in large containers. Some of them grow for several years and others are annuals. This year I planted all new plants as some were no longer producing in abundance. So fellow gardeners and chefs........ Try growing herbs you use through the year, not just the typical basil for tomatoes and parsley. Want to learn more about herbs? Come and hear Linda Grimwade and then visit the Demonstration Garden behind the Horticulture Center. Linda Grimwade a Philadelphia Extension Master Gardener will show how to grow herbs from seed and preserve them by drying or freezing. Participants will also have an opportunity to contrast and compare the fragrance and flavor of herbs, and use fresh herbs in recipes.